Here is a practical volume that focuses on the major security problems for libraries, archives, and museums. 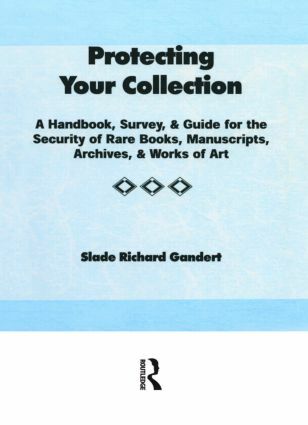 Written by a respected librarian and security consultant, Protecting Your Collection provides provides a thorough review of the procedures for protecting library, art, and archival collections against losses from theft, fire, flooding, and mutilation. Author Slade Gandert includes fascinating interviews with librarians, rare book dealers, archivists, detectives, and security professionals to find out who steals from institutional collections--how they do it and why they do it. Each chapter features case studies of intriguing security leaks in the institutional system and describes their outcome. This important book is beneficial reading for library staff and administrators.